Forces of Geek’s The Man from Hong Kong, Big Mike Leeder continues his in-depth interview (Read Part One HERE) with a true living legend in the worlds of Hong Kong & Korean martial arts cinema, a man known around the world as ‘Casanova Wong’, nicknamed ‘The Human Tornado’ for his kicking ability during his time in the Korean military. Wong honed his martial skills in the icy rivers of Korea before making the transition from real martial arts to the movies, racking up some impressive credits including such martial arts classics as Duel to the Death, South Shaolin Vs North Shaolin, The Shaolin Plot, Duel of the Seven Tigers and many more including the classic Warriors Two. Wong returned to Korea in the mid 1980’s where he worked on further films both in front and behind the camera until the mid 90’s, and continuing his lifelong study of martial arts. Now one of the biggest martial arts and martial arts movie heroes of all time is Bruce Lee, what are your feelings about him. Was he an influence on you? Bruce Lee is a world famous hero, everybody knows him. He is without a doubt the most famous martial artist in the world. I don’t think he will ever be forgotten and it’s hard to find anyone who can replace him. 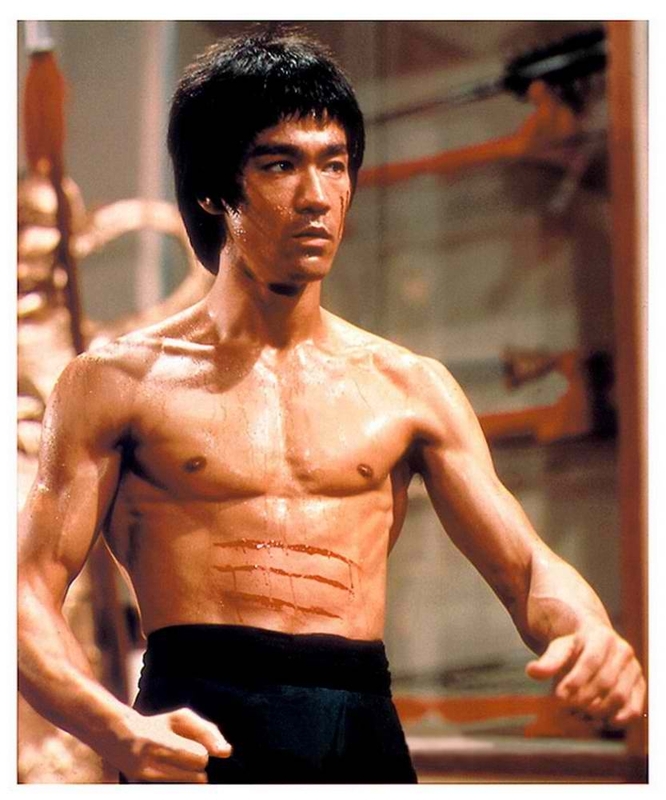 I studied a lot of Bruce’s films, and not only was he a highly skilled martial artist, he was able to express himself very well as an actor, he was able to combine the martial and artistic elements of martial arts in his movies. There have been other martial artists who might have been able to kick better, or do things he couldn’t do, but it was the whole package of Bruce Lee that makes such an impact with audiences around the world. He is able to enthrall an audience, and draw you into his movies through his performance, he had such spirit. I know that he studied acting as a child, his father was an actor and he would appear in movies through his childhood and teenage years, he also began to study the martial arts when he was very young, and perhaps this is one of the reasons he was able to combine these elements so well, he had been involved in both since he was a child. He went to America to study, and tried to break into the entertainment industry over there, and overcame a lot of difficulty to find roles like Kato in The Green Hornet, or the Longstreet series. But in America he never really got to showcase just what he was capable of, perhaps because the market there wasn’t ready to accept an Asian lead at the time. But a combination of things lead him back to Asia, in Hong Kong The Green Hornet, was known as the Kato show, and he already had a following when he returned. In Hollywood, he was the foreigner, almost treated like a second class citizen, but in Hong Kong he was given the chance to be the lead when he signed with Raymond Chow’s Golden Harvest to make his movies. I think a lot of his frustration in the States, turned into focus and inspiration to push him forward in Asia, the struggles he had and the battles he fought to be accepted, made him stronger as an actor, he couldn’t show people his frustration, he had to show he was strong. And audiences identified with him, from the first time you see him on film, he makes an impression on you. Actors who’ve had it easy, can’t bring that depth to a character, you see some movie stars and you know they have never struggled in their lives, but people like Bruce the struggle deep inside motivated them to go on, to overcome great difficulty. I think that Bruce Lee was an amazing martial artist and an incredible actor; I have so much admiration for him. He loved movies and martial arts so much; he sacrificed so many things for them. I don’t think there will ever be another Bruce Lee; it’s nearly 40 years since he passed away and nobody has ever come close to matching him in so many ways. If I could be born again, I would like to be an actor as good as Bruce Lee! Now another admirer of Bruce Lee was the man who really introduced you to martial arts cinema, was Sammo Hung. (In addition to appearing opposite Bruce Lee in Enter the Dragon, Hung has repeatedly paid respect to Lee with references both big and small in so many of his projects including Enter the Fat Dragon, Skinny Tiger Fatty Dragon, Shanghai Express and many more). I was very lucky to have the chance to work with Sammo at the very earliest stage of my career, I was just entering the industry and while my Taekwondo skills were at their height, I didn’t really know anything about film or film-making. He appreciated what I could do and saw potential in me to do much more, and I have such respect for Sammo, he taught me so much and I really think that without him I don’t think I would have been able to continue in the film business, I think I would have stayed in Seoul, just done a few movies here, I wouldn’t have made the move to Hong Kong without his invitation and encouragement. He introduced me to Hong Kong and a lot of people in the industry there. Sammo also gave me the chance to work on the film that I think is one of the best martial arts movies ever made, his movie Warriors Two starring Leung Kar-yen as Leung Jan, myself as Chan Wah-sun and Sammo as Gei Chuen. I was quite surprised at first when he asked me to be in the movie playing a student of Wing Chun, as I was very much known for my kicking ability but I felt it would be a good challenge for me. It was also an important movie for Sammo, his first big movie as director/star for Golden Harvest after Iron Fisted Monk, I knew this movie was very important to him and felt honoured that he had asked me to be involved, and I didn’t want to let him down. I was very surprised to learn that Leung Kar-yen had no real martial arts background, he has an incredible ability to mimic the moves he is taught and make it look like he has known them for years, and I think because he has no specific style that locks him down, he is able to adapt so much more easily, he has nothing that limits him as a new move being opposed to what he has studied before. And it was great to work with him and Sammo in so many scenes, and then against Fung Hark-on and Sammo’s team during the various fight scenes. We were training for the film before shooting began, so we could get a good feeling of what the flavour of Wing Chun was going to be, so that when we demonstrated on camera it looked like we had the foundation. I had to incorporate Taekwondo with Northern Style kung fu techniques, for the finale it’s Wing Chun versus praying Mantis Kung Fu. It was quite a long shoot, and the action scenes were very intensive, Sammo demand a lot of you when he is filming action (laughing), not just when he is shooting action but also for drama and comedy scenes, but especially during the action scenes. 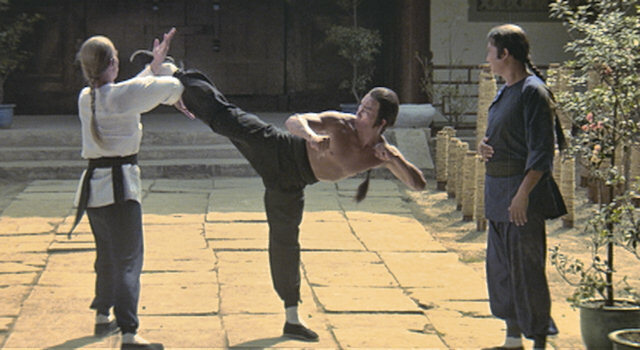 He makes use of a certain amount of contact in the fight scenes, if you’re going to be making a martial arts or action movie you have to be prepared for some bumps and bruises but for Sammo, expect a few more! Sometimes Sammo will explain to you that it’s better to take a real hit once or twice, then spend hours shooting and reshooting if the timing etc isn’t right and there’s no impact. But if Sammo expects you to take a hit, he is also prepared to earn his bumps and bruises on the shoot, he doesn’t expect you to hold back if he needs to get the shot with you hitting him. The jump spinning back kick across the table at the end of the film, that had some power behind it, when I hit Fung Hark-on with that final kick, he was really wiped out by it, he had to spend some time in the hospital. I felt very bad, but both he and Sammo told me it was ok, as they got the shot they wanted. Fung Hark-on was one of the fight choreographers for the film too, I think he was the one who came up with the idea for that finishing move! You did a lot of work for independent production houses on films over the next few years after Warriors Two, et cetera. A lot of independent producers invited me to work on their movies, and while I would have liked perhaps to have only worked on films for the bigger producers like Golden Harvest, I think I was offered a lot of opportunity to work on a lot of different films with a lot of different people by working on independent productions. At Golden Harvest I was able to work with Sammo on Game of Death, Broken Oath and Warriors Two. Later I worked with Ching Siu-tong when he did the movie Duel To The Death. I had the cameo appearance battling the Ninjas, which was great but when I worked for independent companies, I got to play so many different roles heroes and villains, and work with so many different people. In movies like The Master Strikes I got to work with Ching Siu-tong as both a choreographer and an actor, I really like the fighting in that movie and the fact my character goes mad because of events in the film. In The Story of Drunken Master I got to work with Yuen Woo-ping’s father, Simon Yuen (Yuen Siu-tien) and Yeung Pan-pan. In Duel of the Seven Tigers I got to work with Cliff Lok and Philip Ko, and in Master Killers in Taiwan I worked with Philip Ko and the late Blacky Ko. I did In the Claws of the CIA with Secret Rivals star John Liu, and a Bruce Le movie Bruce Strikes Back that shot in Europe. I really enjoyed working on these movies, I got to work with many people I respected and who became friends, I got to work in Hong Kong, Taiwan and back in Korea which was very enjoyable. I treasure the memories of all these movies. But I found the roles started to be less of what I wanted, and I made a decision to return to Korea on a more permanent basis. And the film industry in Korea was thriving, and I was able to work as a director as well as an actor on films like North Shaolin South Shaolin and modern day action movies like Bloody Mafia, which was my last real movie as actor and director. I then did a movie for the South Korean Ministry of Defence, Soldiers Speak Even From Death which was a movie about the military before stepping back from the film industry to concentrate on my business endeavours and my family. (Laughing) I did do some TV in Korea, I even appeared in a soap opera for a while, and it’s also where I started using the Wong Ho name again. It was during this time that I began to look back over everything I’ve experienced, everything that I’ve learnt, my training, my philosophical outlook at martial arts. 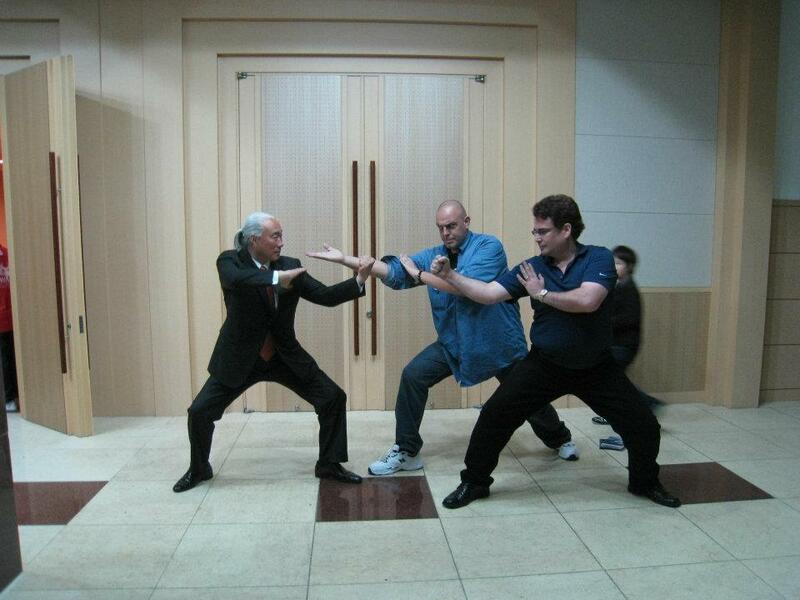 So I began to develop my own style, Cheonji Muye Do (which can be translated as Heaven and Earth Martial Arts). It can be very artistic and beautiful, but also a very devastating and effective form of martial art. I incorporated my love for calligraphy and ceramics into the style, as well as Qi gong, movie martial arts and real self defence techniques. The weapons training is done with enlarged paintbrushes, the basic techniques that are used for writing can be then applied to the use of the sword, the staff etc, the hand techniques from pottery serve as basis for trapping and blocking, it takes a controlled hand. The kicking comes from a combination of both taekwondo and also from the various styles of Kung Fu. I have a book I have written about my style, and I want to introduce this style to the world. It’s funny but earlier we discussed Bruce Lee, he had his Jeet Kune Do and this in some ways is my take on that concept, a blending of the styles and techniques that I have found most effective. But I do not compare myself to Bruce Lee, every man is different and has to express himself totally and freely. I hope that people have the chance to experience Cheonji Muye Do. I want to end this interview by saying a very big thank you to the people who have helped and supported me over the years, a very special thank you to Sammo Hung, to whom I owe so much, to my wife Youn Ju-san, my children Hyun-Min and Sung-Min, to my two friends Guy Larke and Mike Leeder for being like brothers to me, to everyone who has watched the movies I’ve made and enjoyed them, I thank you all. Your friendship and support is most appreciated.